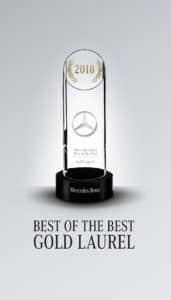 COLLIERVILLE, TN (March 26, 2019) – Mercedes-Benz of Collierville has been honored by the luxury automobile brand as a Best of the Best for 2018, recognizing it among the upper echelon of Mercedes-Benz dealerships nationally. The Best of the Best Program distinguishes dealers based on exemplary performance in sales, service and parts as well as excellence in operations and customer experience. Mercedes-Benz of Collierville was named Best of the Best Gold Laurel, placing it among the top 10 percent of dealerships in the United States. Mercedes-Benz of Collierville has won gold Best of the Best awards for four consecutive years since opening. It did not qualify in 2014 due to requirements a dealership be operational the entire calendar year. Higginbotham Automobiles – which owns Mercedes-Benz of Collierville – also operates Mercedes- Benz of Jackson in Mississippi. That dealership also has captured multiple Best of the Best honors under the Higginbotham ownership, including 2018. “Our overriding priority is to deliver the ultimate customer experience when someone enters our dealership, whether that is for a vehicle purchase or for a maintenance or service visit,” said Trudy Higginbotham-Moody, co-owner and president of Mercedes-Benz of Collierville. “Best of the Best is an indication that we are successfully providing exceptional service at a more-than-competitive price, and it speaks volumes about our sales and maintenance associates. The Higginbotham family constructed and opened Mercedes-Benz of Collierville in 2014 after extensive market research indicated growing demand for the brand in the Mid-South region. The 41,000 square-foot facility is located at 4651 S. Houston Levee Road near the Carriage Crossing lifestyle center. The dealership offers a full line of new and previously owned Mercedes-Benz automobiles, as well as a service departure with the latest diagnostic technology. “This has been a tremendous market for us,” said Higginbotham-Moody. “Demand has been strong and we extremely pleased with our decision to locate a dealership here.